Love is in the air. All you need is love. Roses are red, violets are blue… In the name of love… Don’t go and buy a cliche gift for your special someone this year. Skip the petrol station flowers this Valentine’s Day and plan a perfect night out to knock their socks off. Here are some of our favourite romantic days out in London or if you want to whisk them away to the South Essex coast. Plan 3 or more days ahead and save up to ⅓ when you buy your return train tickets. A Valentine’s date-night in the big city? Stroll across Tower Bridge and take a pic of you and your loved one. It’s one of the most iconic bridges in the whole world and it’s Gothic grandeur is timelessly romantic. Across the bridge you’ll be in buzzy Bermondsey with it’s elegant bars and gourmet restaurants. Plus if you fancy wooing your date with a bit of culture or even just a cocktail, The stunning new Bridge theatre is bound to impress. Walking along the Thames will never lose its romance. 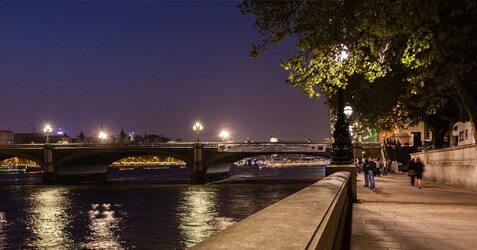 And the South Bank is the perfect place to linger over the views. There are myriad restaurants and bars to cosy up in after your walk. Or add a dash of movie magic and take them to the BFI and snuggle up in front of a film. You could also take your date to dizzying new heights with a trip to the top of the London Eye, St Paul’s Cathedral or the Shard. When you take the train you could also benefit on 2FOR1 entry, saving pennies for those special extras. Whether for an overnight stay or a day away, whisk your beloved away to the closest coast to London. In 45 minutes you can be at the quaint fishing village of Leigh-on-Sea with its picturesque old town, famous cockles and charming pubs. Or within the hour buzzy Southend with its retro arcades, beautiful old pier, and restaurants. Make sure to bag one of our off-peak discount train tickets and save money on your fare. The spice girls sang, when two become one, in one of their classic love songs. You can make this a reality with one of our 2FOR1 offers on London attractions, available exclusively when you travel by train.